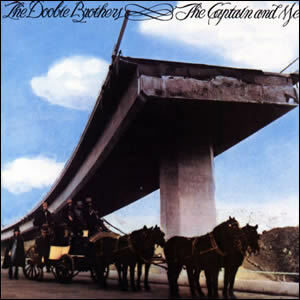 The Captain and Me is the third album by The Doobie Brothers on which they combine their trademark funk with just a touch of California folk and country-rock. Combined, this distinctive yet diverse record was their most substantial and consistent of their early years, offering differing sonic textures and enjoyable tunes for an overall fulfilling listen. The album is bookmarked by several songs from guitarist and vocalist Tom Johnston, including the album’s biggest hits and the title song which combine funk and rock with just a taste of traditional blues. In between and some contrasting, folk-oriented songs by keyboardist Patrick Simmons, which contain unique instrumental passages. The group was formed in 1969 by Johnston and drummer John Hartman in Northern California. Simmons joined a year later along with bassist Tiran Porter and gained a strong following among local chapters of the Hells Angels. In 1971, the band signed with Warner Brothers and released their self-titled debut album to little commercial success. Later that year the band added a second drummer/percussionist Michael Hossack, completing the classic band lineup. The Doobies second album, Toulouse Street in 1972, fared much better on the strength of a couple of hit songs. Warner put pressure on the band to move quickly on producing their third album along with producer Ted Templeman. They began reworking old tunes and improvisational pieces that they played live. The label did help out with the album artwork, providing 19th century garments and the horse-drawn stagecoach from the Warner Brothers film studios lot. “Natural Thing”, a decent melodic rocker with a funky flanged guitar and good harmonies, starts off the album. The song is notable for its synthesized horn effects, which were put together by programmers Malcolm Cecil and Robert Margouleff who overdubbed individual notes to create the chords. Johnston’s “Long Train Runnin'” evolved from a long-time, ad-libbed jam called “Rosie Pig Moseley”. Templeman convinced Johnston to write words to the pure funk song, which also includes a distinctive harmonica solo by Johnston and a heavy presence by the dual percussionists. “Long Train Runnin'” became the band’s first Top Ten single. Another charting hit was “China Grove”, one of the catchiest rock songs of the band’s career, built on a simple but effective riff along with exquisite production. Although the song’s title is based on a real town in Texas, the story is largely a fictional, with lyric’s again added by Johnston to an instrumental track titled “Parliament”. “Dark Eyed Cajun Woman” takes a different approach, much darker than previous material. It is blue-eyed blues with good guitar licks, electric piano, and strings – almost Van Morrison in its feel. “Clear As the Driven Snow” is Simmons first contribution to the album, a bright and acoustic folk song in the manner of John Denver, save for the fact that it morphs into a decent jam towards the end while never leaving the signature acoustic riff. Simmons also wrote “South City Midnight Lady”, an almost country acoustic ballad, which adds a serene, almost romantic element to the album. Pedal steel guitar is provided by Jeff “Skunk” Baxter, then of Steely Dan, who would later become an official member of the Doobie Brothers. “Evil Woman” is probably the weakest song on the album, an unfocused and under-produced song which could have went somewhere had it been better developed. The album’s closing sequence begins with “Busted Down Around O’Connelly Corners”, a short acoustic piece by James Earl Luft which into segues into “Ukiah”, a tribute to a small town in Northern California where the band frequently played in their early years. The song has a Chicago-style upbeat with driven bass by Porter and great lead guitar interludes. “Ukiah” acts as bridge song to title song finale, an acoustic Tune which trys to give the album a bit of a “concept” feel. Still, the song contains soaring guitars and harmonies which concludes the album on a high note. In all, The Captain and Me is a potpourri of sonic phrases which best symbolizes the heart of the early Doobie Brothers sound. Although the band would achieve greater commercial success later in the decade, it was with a different sound and mainly different lineup.